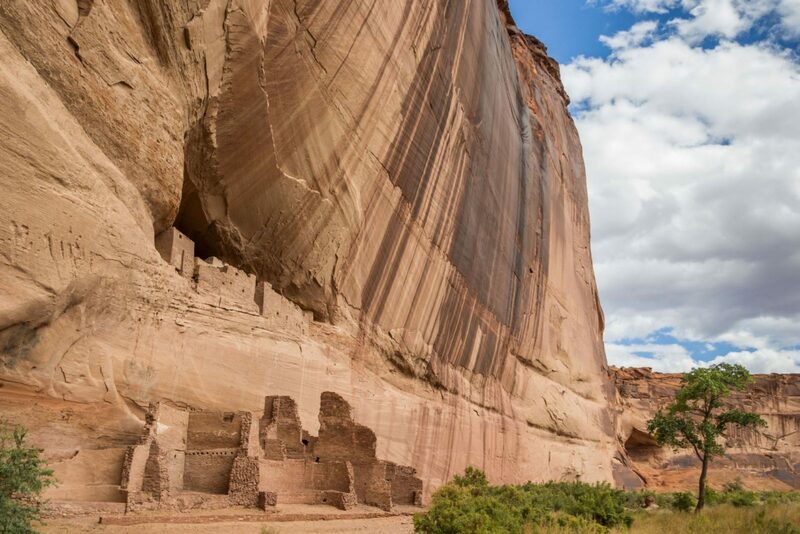 Tour the Four Corners of the American Southwest: Canyon de Chelly, Chaco Canyon, Mesa Verde, Hovenweep, and join the festivities at the Navajo Nation Fair and Rodeo. Day 1: Arrive Albuquerque. 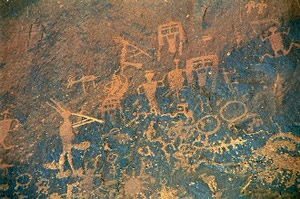 Indiana Pueblo Cultural Center, Petroglyph National Monument. Day 3: Aztec National Monument. Pt. 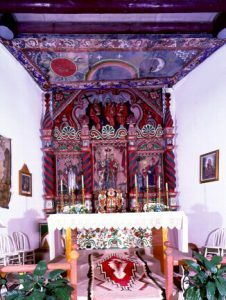 Pueblo. 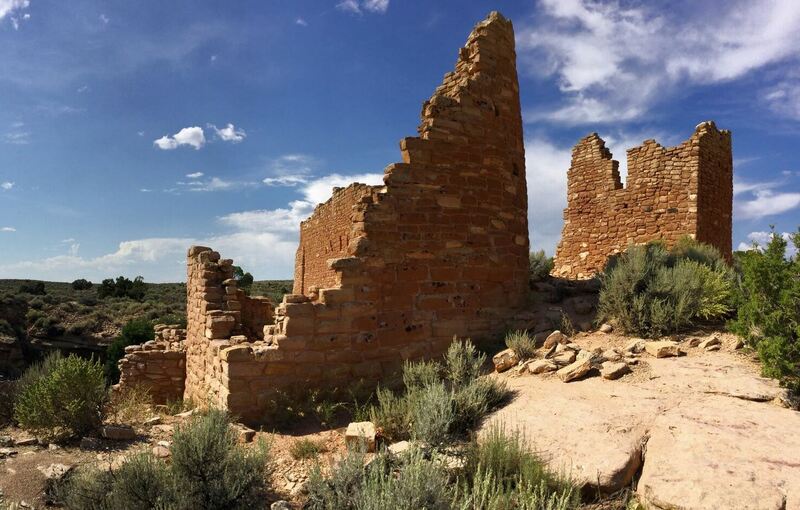 Hovenweep. Day 4: Mesa Verde National Park. Day 5: Ute Mountain Tribal Park. 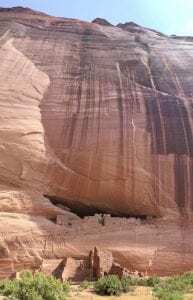 Day 6: Canyon de Chelly. Day 7: Navajo Nation Fair and Rodeo. 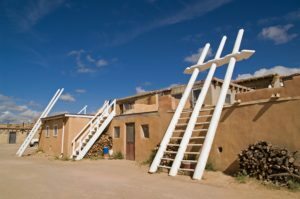 Day 8: Acoma Pueblo. 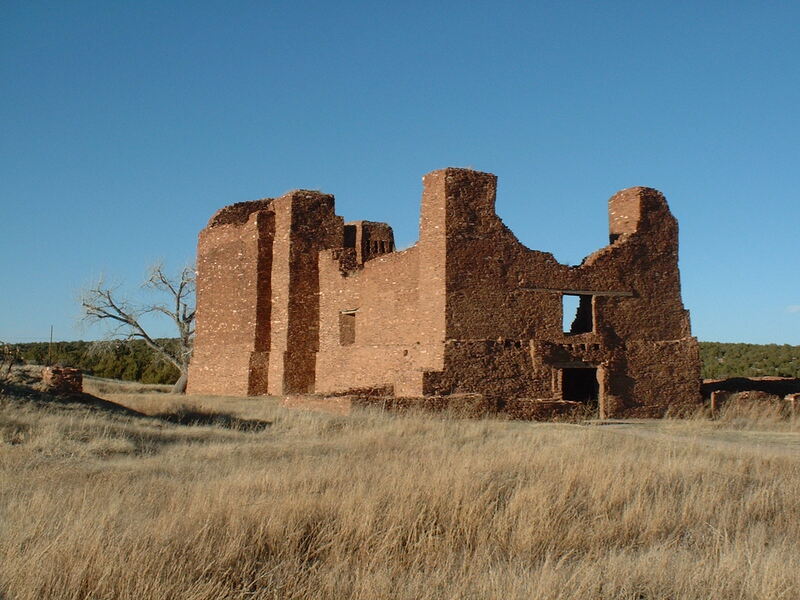 Laguna Pueblo. Day 9: Salinas Pueblo Missions. 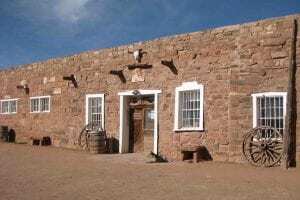 Why the Navajo Fair and Rodeo? Established 75 years ago and held annually in the Navajo Nation Capital of Window Rock in Arizona, this world-renowned five day Native celebration has something for every one to enjoy. Along with an all-Indian rodeo with hundreds of cowboys and cowgirls, there is horse racing, an inter-tribal powwow, a Miss Navajo coronation, a frybread contest, and traditional dancing and singing with people participating in colorful traditional dress. 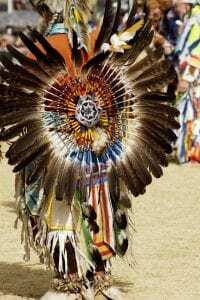 The Navajo are renowned for their turquoise and silver jewelry, sand paintings, and woven rugs, and much is on display during the fair. Legend says that the art of weaving was taught to them by Spider Woman, an important creation figure in Navajo mythology. The Four Corners area of the American Southwest is one of the most breathtaking landscapes in the world. 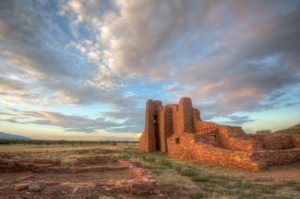 It is an enchanting land of painted deserts, verdant forests, and towering red mesas visible for miles under the brilliant sunlight. 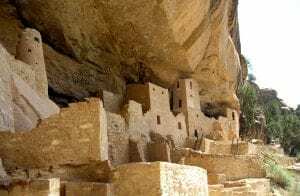 The ancient Anasazi ruins, Colonial Spanish villages and Native American pueblos (villages) reflect a proud heritage intimately in tune with nature and rooted in tradition. 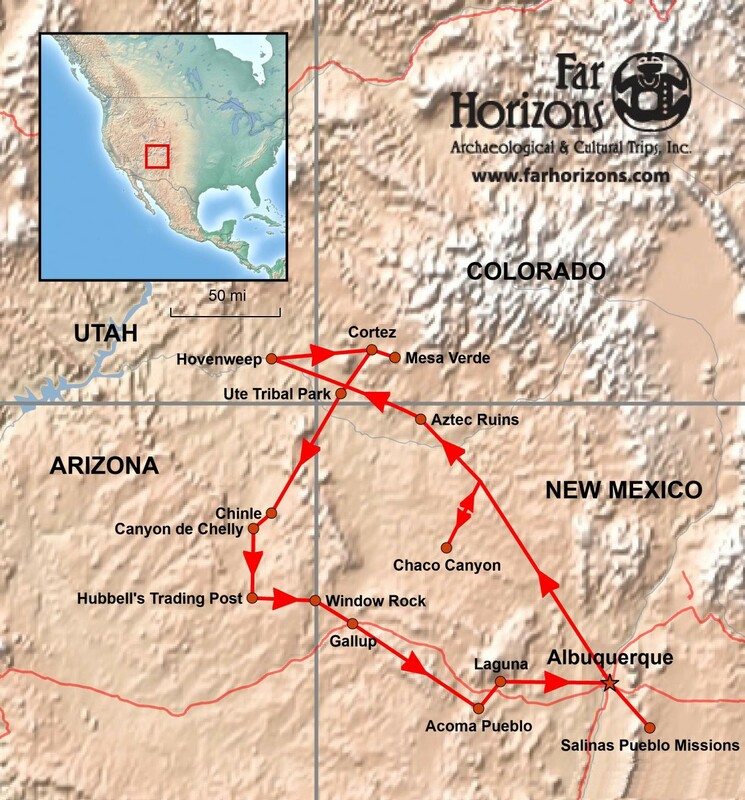 Join Far Horizons for an extraordinary ten day tour of the spectacular Four Corners, where the states of New Mexico, Colorado, Utah, and Arizona come together. 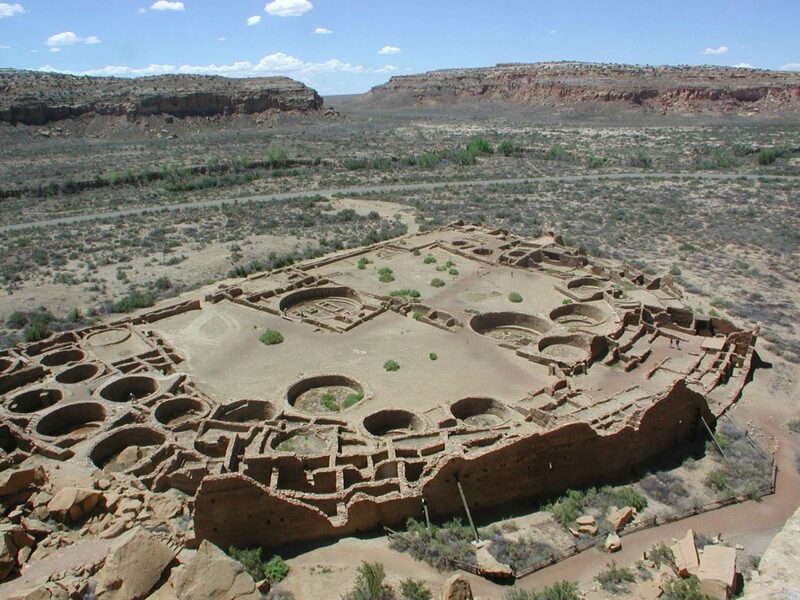 Our trip begins and ends in Albuquerque, New Mexico where we visit the Indian Pueblo Cultural Center and Petroglyph National Monument. We spend a day in Chaco Canyon, a UNESCO World Heritage Site, before moving north to Hovenweep with its free-standing towers, and Mesa Verde, also a UNESCO World Heritage Site. In both the Ute Tribal Park and Canyon de Chelly, Native American guides take us on specially-arranged tours to out-of-the-way areas seldom seen by tourists. 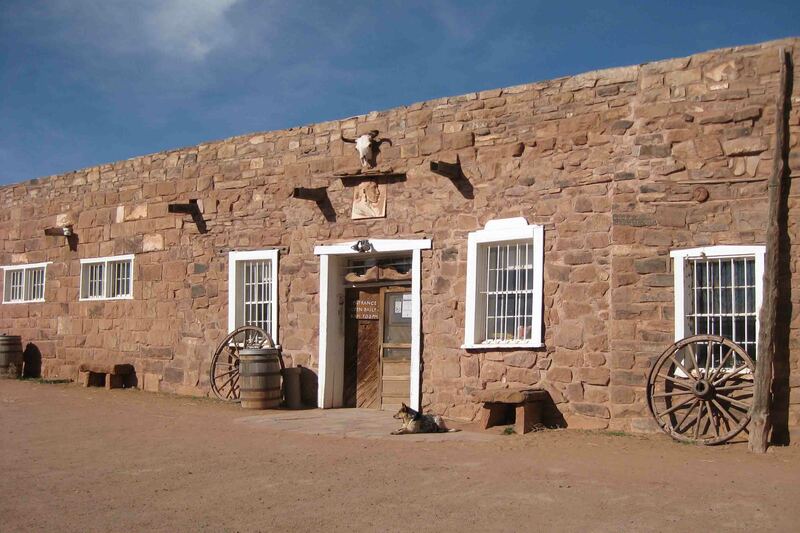 Other highlights include Acoma, the oldest continuously occupied town in the United States; Laguna Mission Church with its stunning retablo; the Salinas Mission churches built in the early 17th century by Franciscans, and a full day at the Navajo Nation Fair and Rodeo. Join us on this Four Corners tour as we travel through a truly enchanting part of the United States! Todd Bostwick received both his M.A. 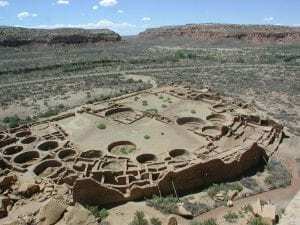 in Anthropology (with an emphasis on Archaeology) and his PhD in History from Arizona State University. 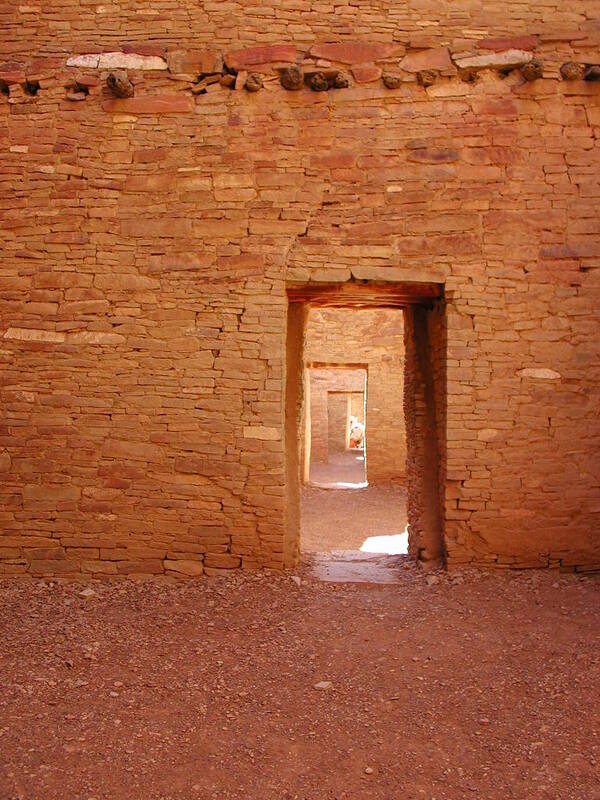 He is presently Director of Archaeology for the Verde Valley Archaeology Center in northern Arizona. 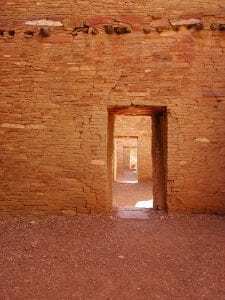 For twenty years he was the Phoenix City Archaeologist at the Pueblo Grande Museum. He has also taught at Arizona State University. 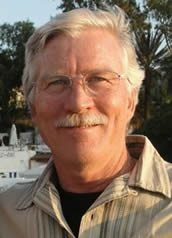 Dr. Bostwick is widely published, including both books and articles, and has been featured on video productions for PBS and the History Channel. 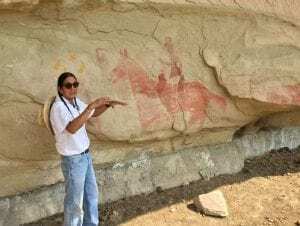 He has curated more than a dozen exhibits on the American Southwest, and given more than 400 talks at seminars, professional conferences, museums and other public events. 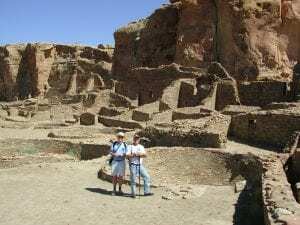 Dr. Bostwick has been the recipient of several awards, including from the National Park Service, the Arizona Governor’s office, and the Arizona Archaeological Society. 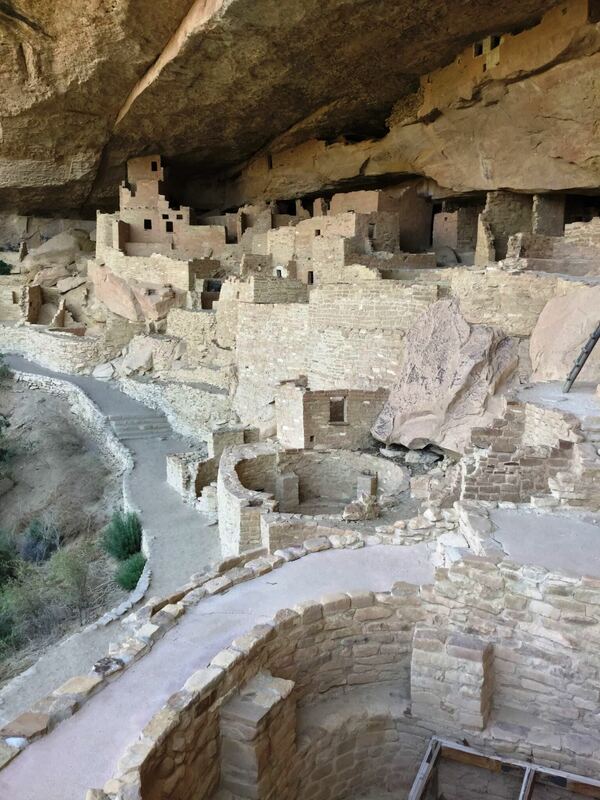 $7,495.00 (per person, based on double occupancy) includes accommodations based on double occupancy, meals as noted in the itinerary, entry fees to sites named in itinerary, ground transportation, gratuities to guides and drivers; and emergency evacuation insurance for each participant. Single Supplement: $595.00 Far Horizons will attempt to find a roommate for participants requesting that we do so. However, if one is not available, the single supplement will be charged. 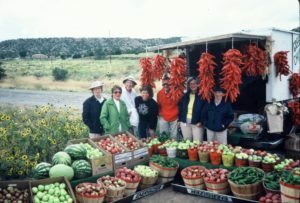 Cost Does Not Include: Flights to and from Albuquerque, New Mexico; a separate donation check of $150.00 per person to a designated donation project; meals other than those listed in the itinerary; food, alcoholic and other beverages not on set menus; airport or departure taxes; laundry; excess baggage charges; personal tips; luggage handling; internet, telephone and fax charges; or any other items of a personal nature. 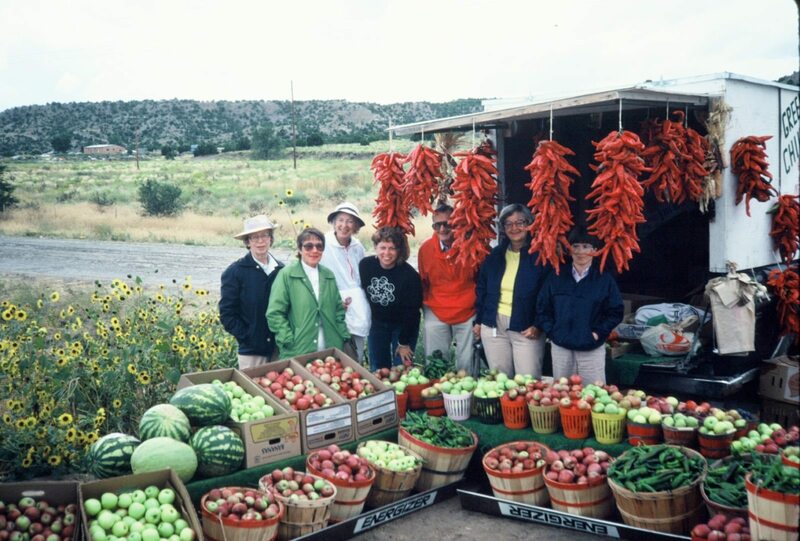 The cost of the tour does not include air tickets into and out of Albuquerque. 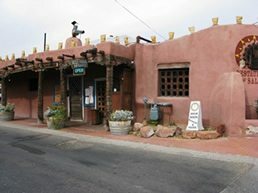 The Albuquerque hotel offers airport to hotel transfers. You must contact the hotel to confirm your transfers. You are responsible for all flight arrangements and transportation (including airport transfers) to join the group. If Far Horizons must change the trip dates or cancel the trip for any reason, Far Horizons is not responsible for any air ticket you may have purchased. A deposit of $750.00 is required along with your registration form. Final payment is due 120 days before departure. Upon receipt of your deposit and completed registration form, you will be sent a reading list and tour bulletin containing travel information. Click here to download the Registration Form. Cancellations received by Far Horizons in writing at least 120 days before departure will result in an administrative fee of $450.00. Cancellations received less than 120 days prior to departure will not receive a refund. If for any reason you are unable to complete the tour, we will not reimburse any fees. Registrants are strongly advised to purchase travel insurance that includes trip cancellation upon registration. We will be traveling into remote areas. The itinerary is designed for those who are active, in good health and have a spirit of adventure. Hotels will be simple and clean but will not be five- or even four-star. Most will not have bell staff so you may have to carry your own luggage. Meals will not be haute cuisine and several lunches will be picnics or box lunches. 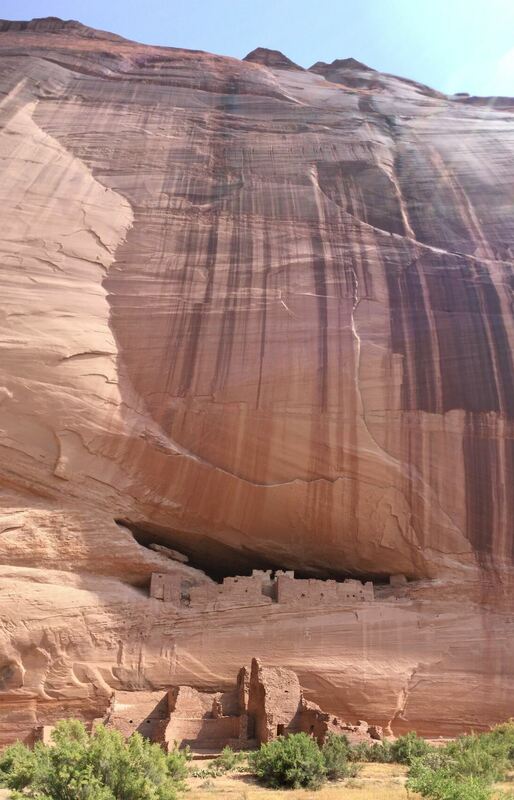 At times we will be walking over uneven terrain for a mile or more; hiking boots are strongly recommended. All participants are expected to be physically active and able to walk independently throughout our very full touring days. Keeping up with the group is each participant’s responsibility. We will be at altitudes from 5,000 to 7,000 feet. August is ‘monsoon’ season in the Southwest. 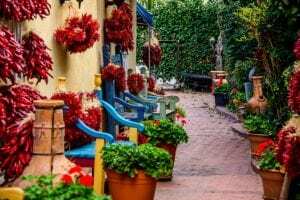 There is a possibility of showers in the afternoons which will keep the temperatures lower than at other times in the summer. Team spirit and a good sense of humor are vital! If you have questions about your ability to handle this sort of challenge, please call us.